Bheemeshwari is a haven for over 200 species of birds. To name a few - grey headed fish eagle, pied crested cuckoo, darter etc. Mammals include sambar, spotted deer, jackals, elephants and leopards. However bheemeshwari is known for mahseer fish around the world. Anglers come to this place and end up in angling 100 pounds mahseer many a times. Activities possible: Joy fishing, a coracle ride in river cauvery, professional angling, river rafting during monsoon, trek to 4000 feet high basavana betta. Season: Monsoon from June to Aug.is best when the forest is green. September to Feb is cool and right time to visit. Summer is warm, especially during afternoons. Corporates can also do a day out to this place. The above tariff is valid from 15th September 2011 till 15th July 2012. There will be a 20% hike from 23rd Dec 2011 to 3rd Jan 2012. Tariff is couple per night. Check in 12 noon & Check out 11 am. 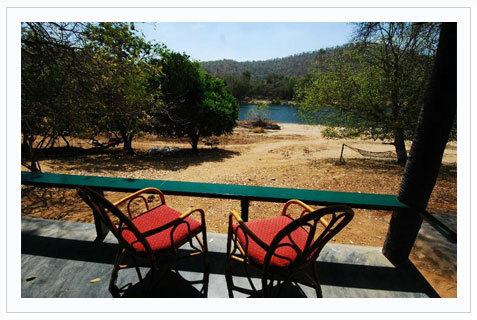 Cost includes stay, all meals, coracle ride, joy fishing, guided trekking, elephant ride ( subject to availability), campfire, forest entry fees, camera fees & taxes. Day Visit Rate mentioned are per person. Single occupancy charges will be Rs. 5050 for log hut, Rs. 5350 for cottage and 4450 for tented cottage per room for indians & 5700 plus 1550 for foreigners. River rafting charges are extra.